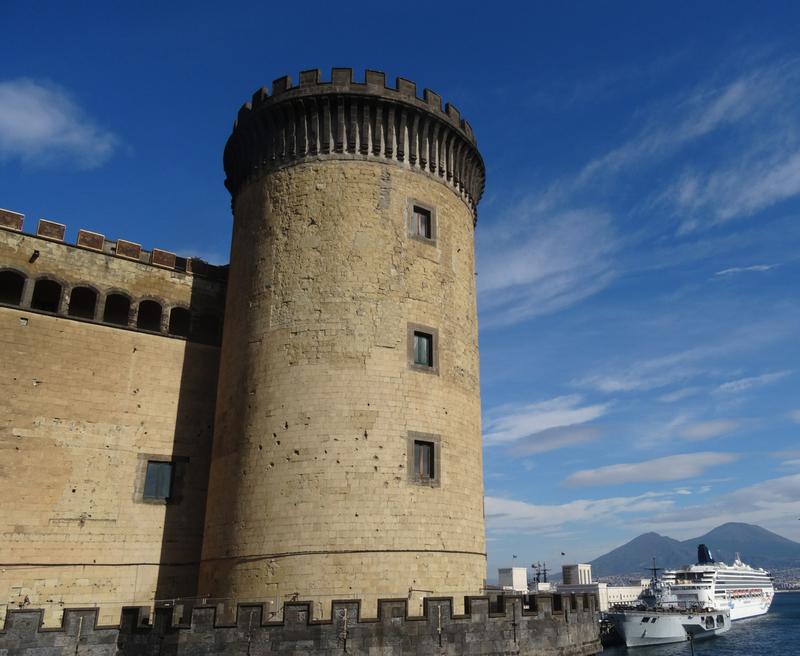 Publius Vergilius Maro (70BC to 19BC), probably Rome’s greatest ever poet, is said to have placed an egg in the castle, not to keep the egg safe but to keep the castle safe. So long as the egg is fine all will be well. 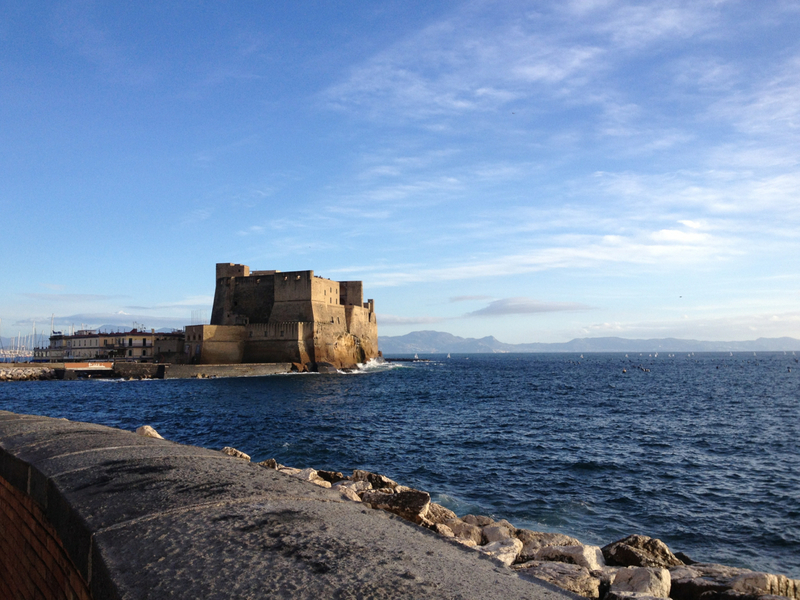 Part of Virgil’s fame in Naples is because he moved from the north to live near the city, and he chose the area at nearby Cuma as a pivotal place in his epic 12 book poem The Aeneid. Naples has never forgotten this. Virgil’s tomb is in the city and his name has been given to one of its most beautiful parks – Il Parco Virgiliano – which has views across the sea to Capo Miseno where Aeneas’ trumpeter Misenus lost his life after an arrogant challenge to the gods. 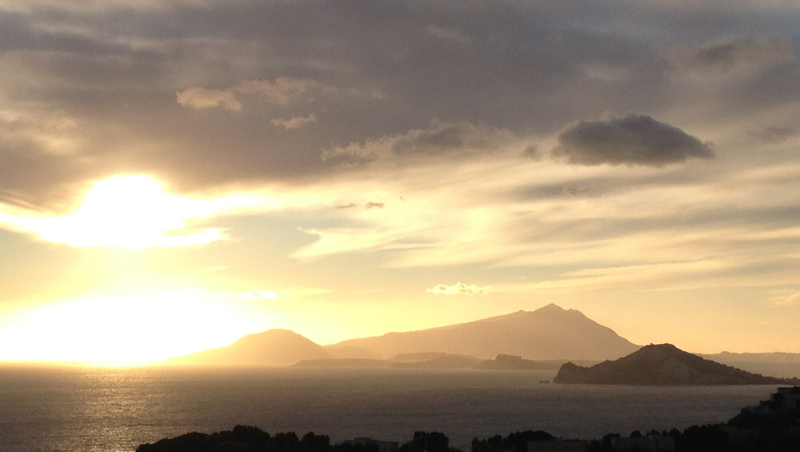 View from Parco Virgiliano towards Capo Miseno and on to the islands of Procida and Ischia. 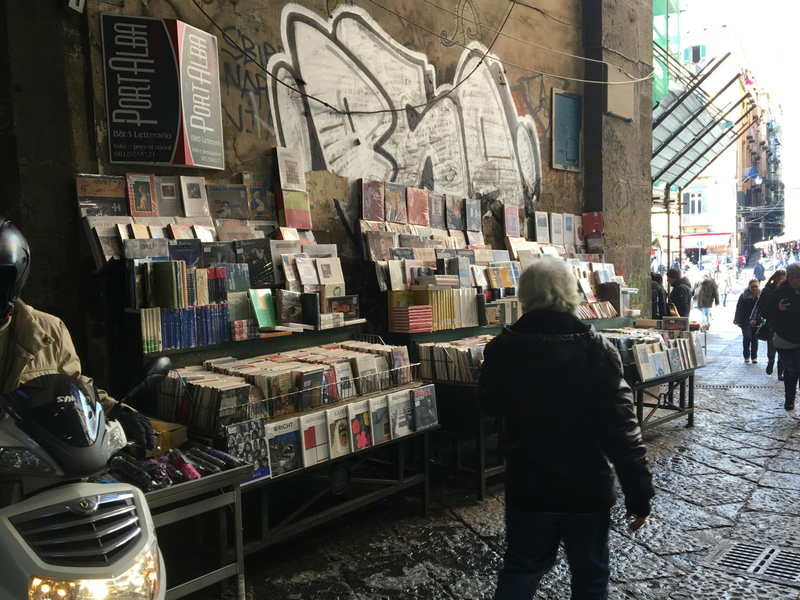 From Virgil on the seafront it’s a short walk to the modern bookstore La Feltrinelli on the edge of Piazza dei Martiri. 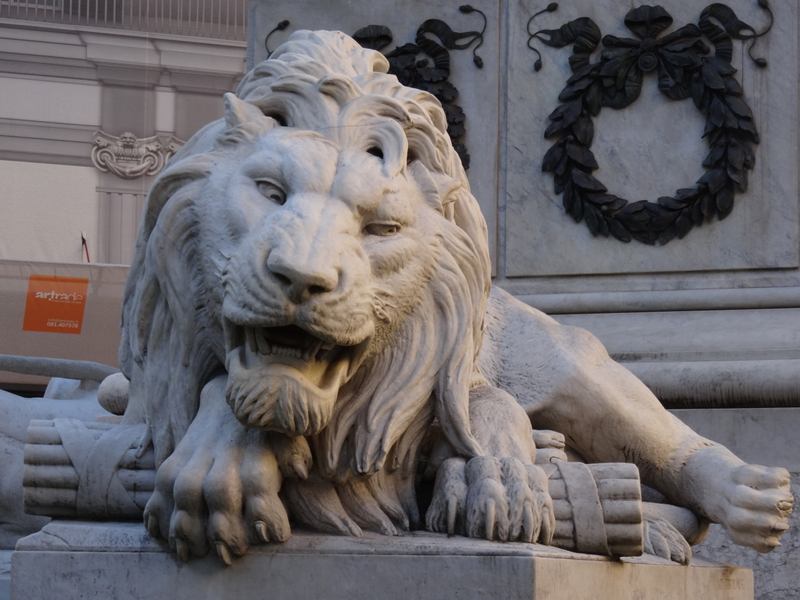 This piazza has four angry lions, each representing the lives lost in uprisings from 1799 to 1860. A strange coincidence to be starting my search here for a novel about the life of a young Portuguese writer, Eleonora de Fonseca Pimentel, who was put to death in Naples after the Parthenopean revolution of 1799. 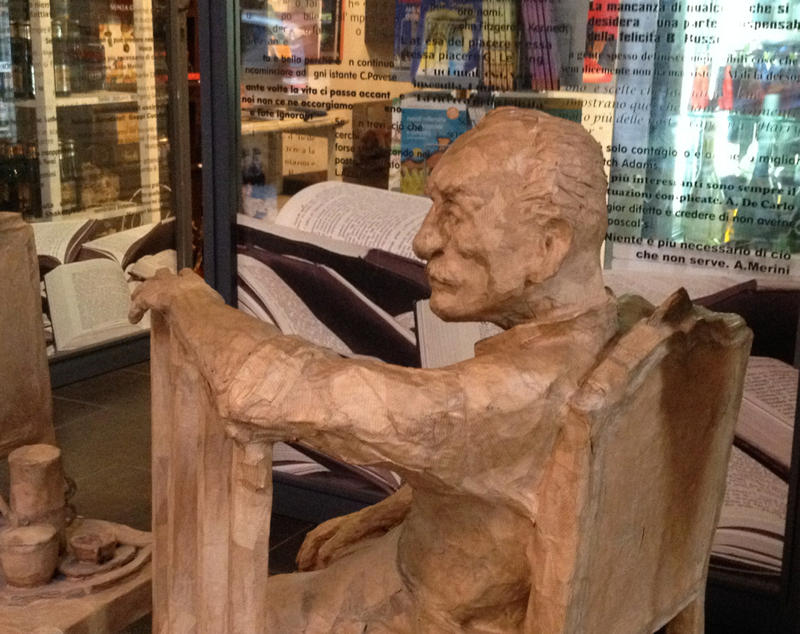 The only problem is that the book is not in stock – in fact, it’s out of print. 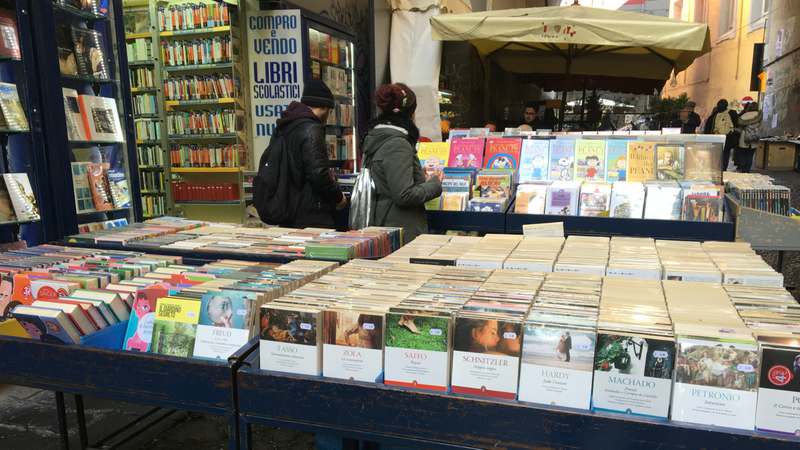 I’m told to try the bookstalls in Port’Alba, so off I set. 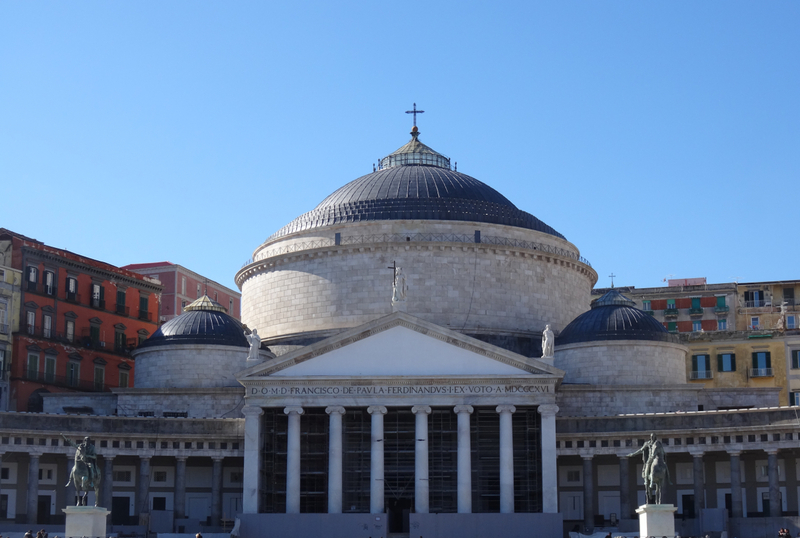 After Piazza del Plebiscito I pass the Biblioteca Nazionale known for its work with the Papiri Ercolanesi, a collection of ancient scrolls that is said to be the largest classical library still in existence. 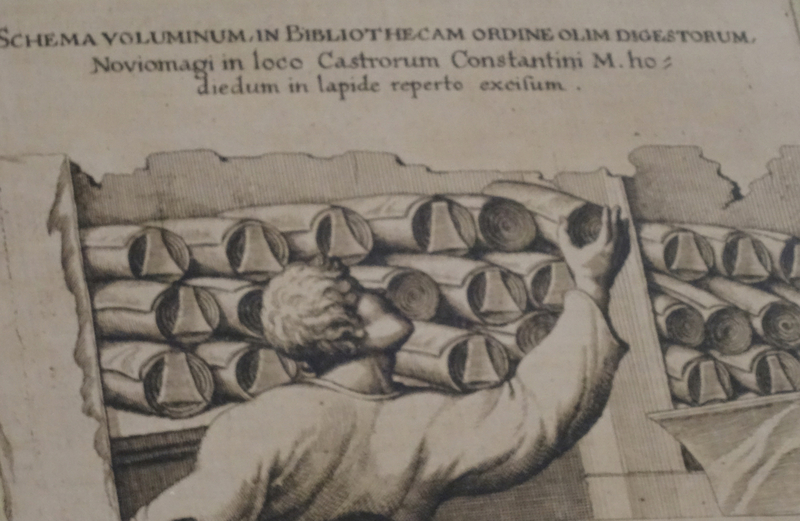 The scrolls, charred enough to barbecue on, were buried by Vesuvius in AD79 and unearthed at Herculaneum over a millennium and a half later. Their unravelling since then has been a mixture of disasters and discoveries, but there’s hope that new forms of x-ray might boost progress. 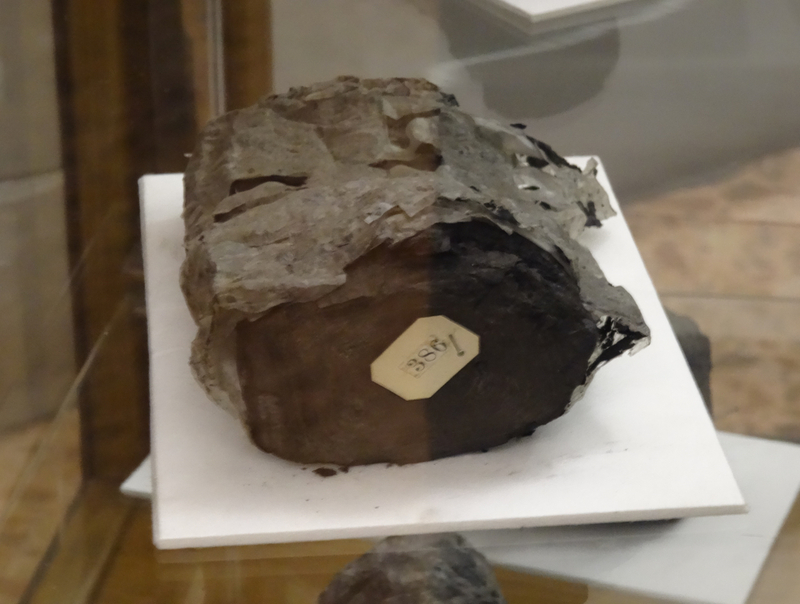 One of the Herculaneum papyri – part of the only classical library of any size to have survived from the ancient world. Beyond the library I leave Maschio Angioino (Castel Nuovo) to my right. 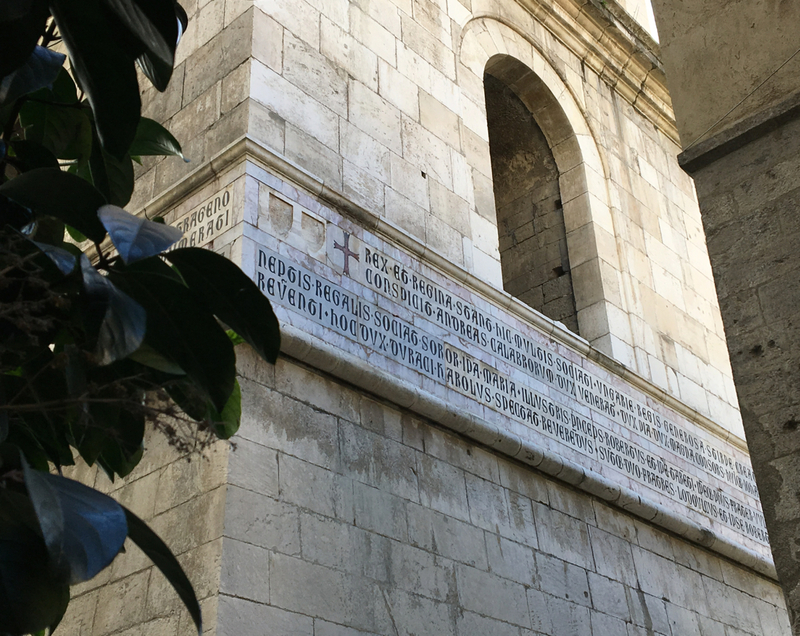 This is where the Italian scholar and poet Petrarch (Francesco Petrarca) was interviewed by the Angevin king, Robert the Wise. Petrarch (1304 – 1374) was a great intellectual force, some now say he was the intellectual force, behind the Renaissance. Robert the Wise, known for his love of books, wanted to meet Petrarch, and to see for himself whether the poet was worthy to be crowned Laureate. The ‘interview’ went on for several days and at the end Petrarch emerged victorious. I follow the wide roads along from the castle and then turn into the centro storico towards the university founded by Frederick II, with a theology department started by Thomas Aquinas. Before I reach the university I take Via Santa Chiara, and walk up towards the bookish world that crowds the edge of Piazza Bellini. I’ve been told that here, in amongst the bookshops by the Music Conservatory, and into Port’Alba I might find what I’m looking for. The name of the book is Il Resto di Niente (The Remains of Nothing) written by a Neapolitan journalist Enzo Striano, and last published in 2005. I try the crowd of small shops. Everyone has heard of Striano but nobody has this book – out of stock. I stop for some bruschetta and a caffè at leafy Intra Moenia, in the Piazza Bellini. Books are for sale in the café but there’s still no sign of the one I’m after. 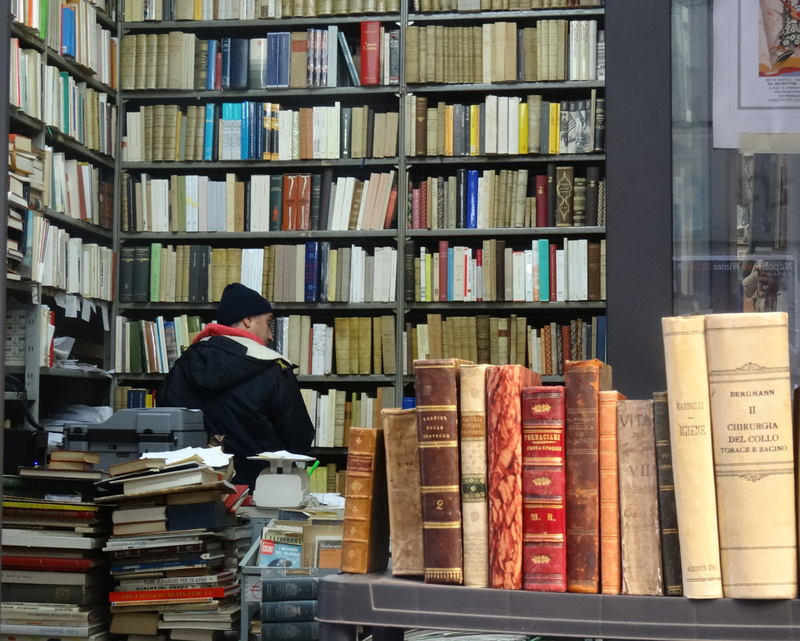 I move on – an obvious stranger amongst the haphazard layers of books that seem to squeeze out of the seams of the city itself, guarded by dark-eyed watchmen. But in the end, and with much help, I do find the book. It’s the last copy left on a lower shelf in a shop in Port’Alba. 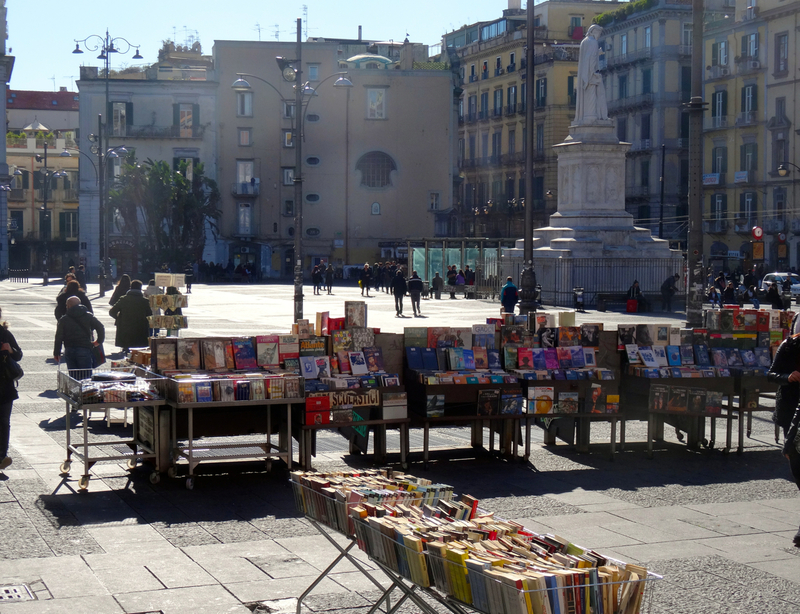 Mission complete I start for home through the sunshine of the wide, book-selling piazza at its end. 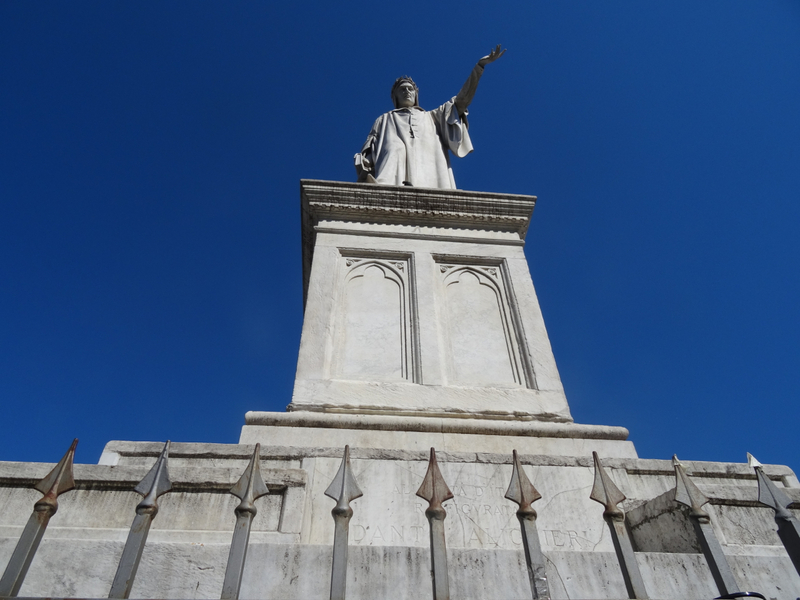 But there – blocking the full stop of my story – is another literary giant, Dante D’Alighieri (1265 -1321). 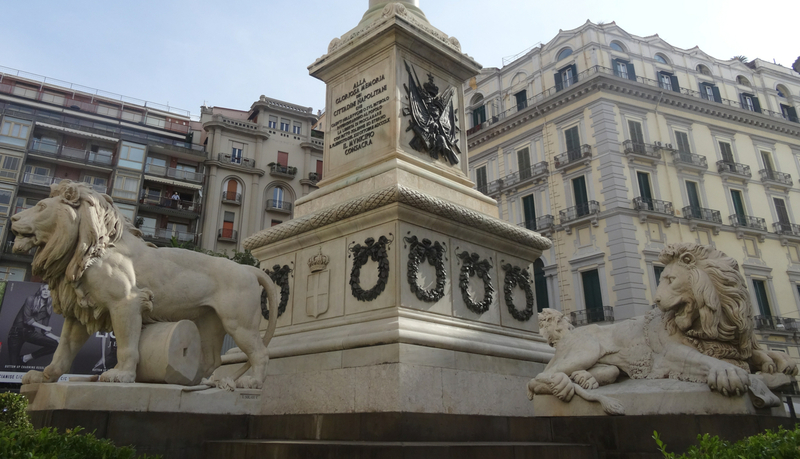 As far as I can see he had no direct connections to Naples but his statue was placed into this grand piazza for diplomatic reasons following the unification of Italy. 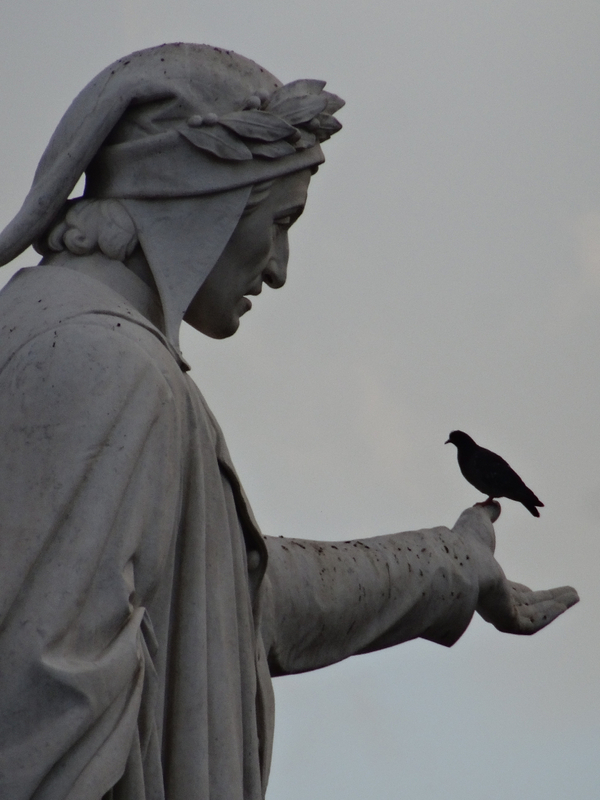 A good choice perhaps considering Dante’s most famous work, La Divina Commedia, was written in dialect rather than Latin, and the dialect he chose to write in was the one that would go on to become the language of all Italy – Italian. I slip past Dante reminded suddenly that I, an English-speaker, might not be able to read much of the finally-found Remains of Nothing … written, of course, in Dante’s Italian. 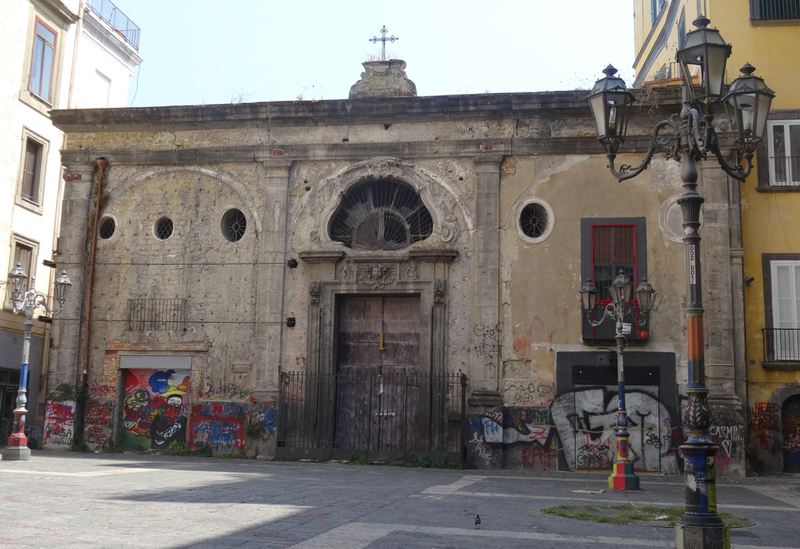 This entry was posted in Italy, Naples, Other discoveries in Naples and tagged Enzo Striano, Herculaneum, Il Resto di Niente, Napoli, papyri, Petrarch, Piazza Bellini, Piazza dei Martiri, Piazza del Plebiscito, Port'Alba, Robert the Wise, Vesuvius, Virgil. Bookmark the permalink. 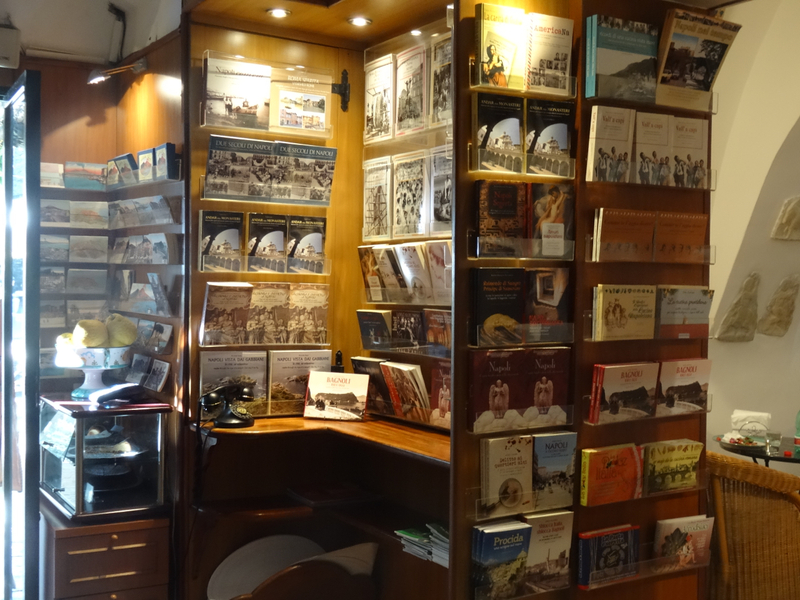 I went to lots of bookshops while I was in Naples and Rome looking for STORIES FROM THE PENTAMERONE by Giambattista Basile and to no avail. I didn’t have the language and the time to really nail it but I’m sure a copy was out there somewhere. I will pursue it again on my next trip. With much envy of your eventual success!